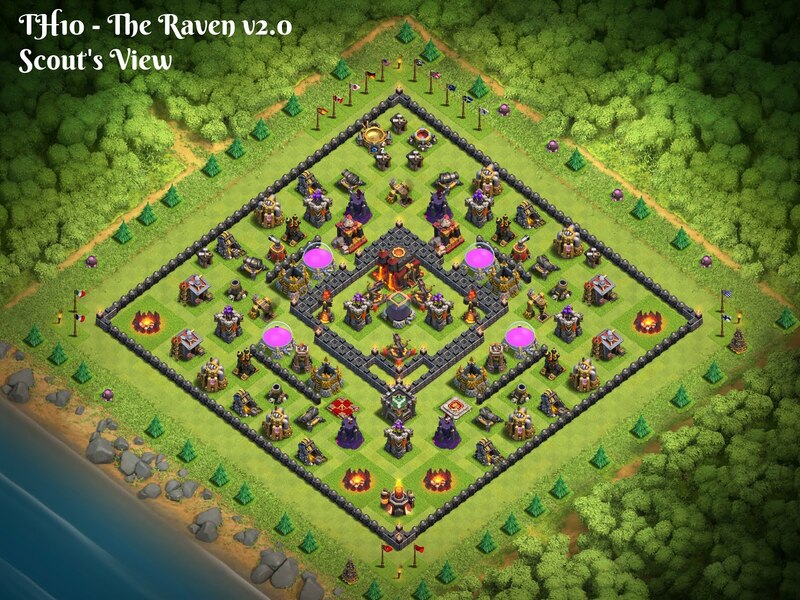 Most players who go out raiding will do so with barch, gibarch, goblins, GoWiPe, and GoWiVa. These armies have fairly specific pathing in the troop AI. Knowing this, bases can be designed to put enemy troops in the line of fire for extended periods of time. Although there are techniques and army comps that can beat these open bases, they are not commonly used in farming resources so the base design works very well. Look at the base as having three rings leading into the hub. The outermost ring is comprised of resource and army buildings; things non-specific target troops will go after. In the case of a barch, the troops will be focused on these buildings while being fired upon by the second ring. The second ring is where the magic really begins. This rain is comprised of the first layer of defenses. Giants, and other troops that target defenses, will immediately walk to this ring and then proceed to walk around the core. As they walk around the base, they will come under fire from both the core as well as the defenses in the second ring. The innermost ring is also a resource ring and this is where gold and elixir storage is reside. This ring is most protected by the defenses in the core of the base. Troops that reach this inner ring spend a lot of time beating on storages, under heavy fire from core defenses. The core itself is designed to maximize defense for both protection of the dark elixir storage as well as the ring immediately outside the core. Notice the positioning of the spring traps; the wallbreaker AI will send them straight into these or nearby bombs, so anyone who spams wallbreakers or only carries 4-6 will not be able to break the walls using them. X-bows are positioned for maximum effect as is the tesla farm. 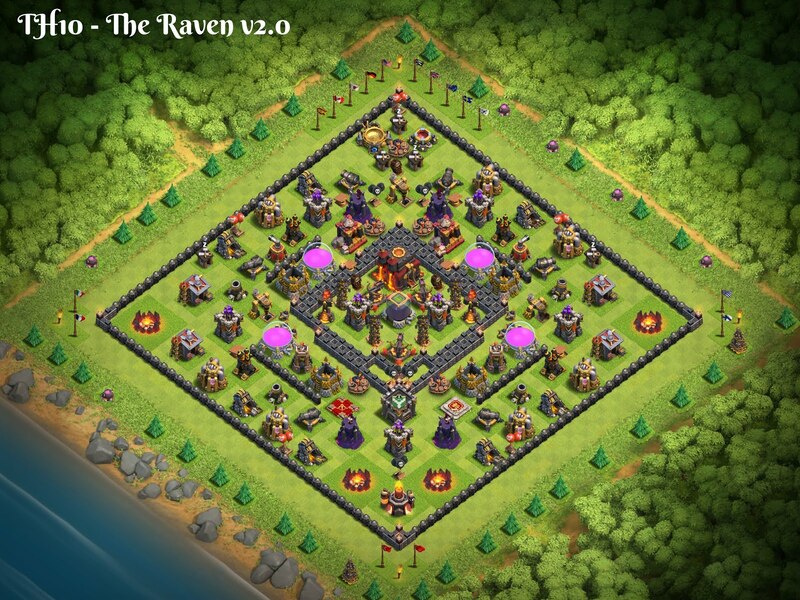 This version of the core swapped the x-bows and archer towers to increase defensive strength to the top of the base. Inferno towers in the corners shore up the corners of the base in general and keeping them set to multi-target means they hit a lot of troops walking the rings. X-bows are set to ground to increase their range. Air attacks are uncommon in the regular multiplayer game, even at TH10. Air bombs, air defenses, and air sweepers are positioned outward to aid with fighting the queen walk (which IS common at TH10). The one seemingly unusual thing I did in this design was to place the Bomb towers between storages in a resource ring. Although this seems out of place, they are behind a wall so defense targeting troops will still continue around the perimeter of the ring, moving to other defenses that are closer are more easily reached. Trap placement is predominantly within the rings. 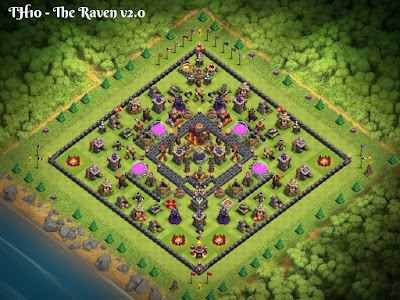 We get anti-queen-walk from the placement of air-bombs and air mines; anti-wallbreaker from spring traps on the core exterior; damage to tanks walking the defense ring from various bombs and spring traps; and the positioning of skeleton traps near the inferno towers will even keep troops like miners busy while the inferno and tesla towers take them out. The bottom of the base has both point and splash damage as well as the Clan Castle (CC). The CC, along with the heroes (when up), factor heavily in defending the bottom quarter of the base. While enemy troops fight CC troops and heroes, nearby defensive structures take them out with splash damage (wizard towers and mortars) and point damage (archer towers and cannons). So...what's so great about this base? It's anti-queen walk/super queen; almost ALWAYS receives 30% damage so a nearly guaranteed shield; separates weaker troops from their tanks; runs the tanks in a circle so they're more easily picked off; core is anti-wallbreaker and heavily defends DE; looks easy and will draw weaker attackers (and more fails); and based on proven designs. This base is not 100%, though; absolutely no base design is unbeatable. Good attackers can beat it if they know how, but...they seldom have the right army composition to do so. I've had it running a while now and the results have been very positive. When the base gives up stars, it is usually with destruction in the 30%-60% range; it has not been three starred yet and every real attack has resulted in a 12 hour shield. Opposing armies vary from simple barch to golem based armies. It seems that I've been getting attacked only when my resource collectors have a decent amount in them, so successful attacks walk away with 100K-150K in gold/elixir and 500 or so in DE. (This is regardless of how much is in the storages.) Of course, I consider those to be very acceptable losses in TH10 Masters league and since I'm not trophy pushing, I don't really worry about losing trophies. And as you can see from the pictures of my TH10 game, I am not maxed TH10 by any stretch (although I do have a maxed core, minus the archer towers). I've included wall-only and scout's view images below. If anyone has any feedback, I'm always open to hearing it. Special thanks to Aphrodi and Radiating whose early designs provide the inspiration for this base design. I liked your layout as a starter and did some modifications to increase town hall protection and move the clan castle in the core for a more difficult draw. My upgrade to TH10 from a max TH9 completed on 4/27/17. From that time my defense wins are around 75%, which is not bad for a baby TH10, in high gold to mid crystal league. I would love to send a screen shot to you. Feel free to send it over! I've made some minor revisions for b3.0 and will soon be publishing it. I'd be interested to hear about your updates and how they've fared in the last couple of months.